Tracking things is moving to a new level. Using IoT technology to track things is hardly a new concept, but the way it’s been done is evolving. For example, Tile, the small Bluetooth tracker, is one of the best known. I stuck one onto my wife’s often misplaced keys so a quick tap of the Tile app causes the Tile to emit a sound. However, when the keys are a great distance away, the app connects to other phones who also have the Tile app, in hopes that one of those phones is near the misplaced keys. If the app is always running in the background, it will recall the last place and time the keys were near the phone, a nifty feature for anyone who frequently misplaces things. Then there are the methods of tracking luggage. Airlines including Delta and now American Airlines have luggage tracking of a sort, so you can follow the stages when the bag is scanned, such as letting you know it was scanned to be put onto the plane. An even better luggage tracker I’ve been using is the Tumi Global Locator that came out earlier this year, as I wrote about here at the time (Tumi, AT&T Team To Track Luggage Anywhere In The World). Rather than using the connectivity of crowds, Tumi uses the AT&T network so it can be tracked anywhere in the world. That device, dropped into a suitcase before a trip, tells me my bag is actually on the plane I’m on and when it’s coming out at baggage claim. The Tumi device uses Wi-Fi, Bluetooth and cellular. Now Samsung is getting into the consumer tracking market in a big way. It’s new Samsung Connect Tag, billed as the world’s first consumer mobile product to use narrowband network technology, takes a different approach to connectivity. The narrowband technology, referred to as NB-IoT, is the cellular communication standard for small data utilization and low power consumption. The small tracking device uses GPS, Wi-Fi-based positioning, and cellular identification so it can tell its location both indoors and outdoors. The device can be put into a child’s backpack, clipped to a pet’s collar or left in a car. 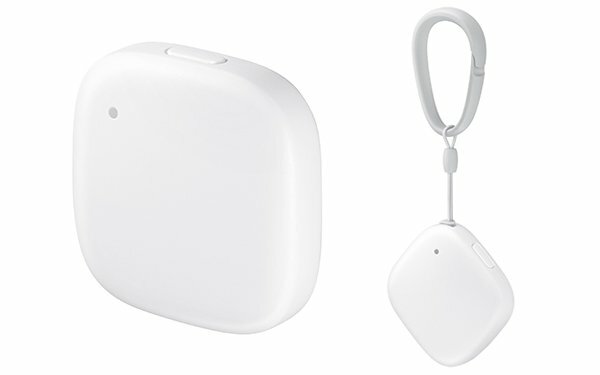 As might be expected, Connect Tag will be tied into the SmartThings ecosystem so that it can connect with smart home appliances. Because the device has geofencing capability built in, it could signal to other home devices when a person is near home so that lights could be turned on in advance. It also could send a notification when a child enters or leaves a school yard. Connect Tag, being shown at the Samsung Developer Conference later this week, can last a week on a charge and is expected to go on sale in Korea before other countries.